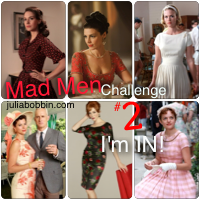 The dress that inspired my part in the Mad Men Challenge is the one worn by Peggy Olson in the picture below, right. I don’t remember her wearing it in the show. This girlie, voluminous style is more often associated with Betty Draper (left). But I wanted to make a dress out of a fabric I’ve had in my stash for quite a while. It’s a cotton print by Alexander Henry, a big-scale design named “Georgia” inspired by the work of the US artist Georgia O’Keeffe. I’m 5’4″ so I did worry that the large, carnivorous-looking flowers would eat me up. But those flowers and the blues and greens are the very reason why I love this fabric so much. Had the risk payed off, this would have been my favourite dress ever! The pattern was drafted on my pattern-cutting course. I took my tutor’s advice and used pleats rather than gathers to add volume to the skirt. Gathers might have produced a more child-like, stouter look. I made a bodice toile which showed that the design was too generously proportioned, but no matter how much I kept trimming off here and there, the dress still feels too big for me. Maybe the large print really can’t work. But I enjoyed making “Peggy Georgia” and had a great time with my mum who did her best to take decent pictures of me wearing it. I don’t know what will happen to this dress. I could take it apart and make a different garment out of it. Or should I keep it for the right occasion? What do you think? Inspired by the blog Tilly and the Buttons, from Saturday 24th to Friday 30th March, we pledge to wear garments made from one pattern. My chosen favourite is the BSB which is the Skirt Master Pattern in the Reader’s Digest Complete Guide to Sewing. 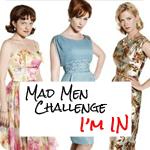 It’s 10:30a.m and I’m at Macculloch buying the zip and thread for my Mad Men Challenge Dress. Being very new to this posing-whilst-looking-presentable business, I got side-tracked by an argument with my photographer (“Don’t make me look short!” “But you are!” etc. ), and so failed to check if my skirt was on straight. This Basic Skirt Block is made of claret corduroy and cut on the bias with the ridges meeting in a V in the middle. To line it, I had valuable help from Slapdash’s tutorial. The top is Nicotine Surprise. A hybrid of the BSB and Vogue 1247. I haven’t bought the V1247 pattern, but added pockets to the basic skirt after getting the idea from Vacuuming the Lawn . Here’s her photo of what the innermost layer looks like. My internet research suggests that the V1247 is shockingly short and as a rule, it’s best to add a centimetre length for each year over the age of sixteen. These pockets are deep enough to stash roadkill. This is the first garment I made where the seams across the zip lined up at first go, so to celebrate the momentous occasion, I enhanced the feature with some yellow top-stitching. This adds to the jean skirt effect, but the fabric is actually an old, mock-denim IKEA curtain…. The whole thing is hardly in the Vogue spirit! Today, my Pattern-Cutting Course here comes to an end, sadly. This skirt is made from a snipet of super-silky faux fur which I bought without checking the length: 43cm! Finished skirt length: 41cm!! The jackboots detract from the Cougar Lady effect. Today, the claret Basic is teamed with a charity shop top and my old Dune sandals – their first outing of ’12. The kids have named these sandals Space Grapes. Apparently, if you eat the grapes, you become very heavy. That’s probably because they contain heavy metals. Incidentally, we call this plant Snake Grapes. My plans to wear a woolly Basic for OWOP have had to be trashed in favour of this hybrid. The top of the dress is New Look 6459 with added waist darts which have been merged into the Basic Skirt Block for the lower part. This dress looks great with high heels, tanned legs and two months of a lower-stodge diet, but as it’s March I haven’t had two months to prepare! Out in claret corduroy and Nicotine as I road-test the new boots I got for my birthday. So OWOP, I’ll associate you forever with sunny skies. You’ve forced me to rethink my wardrobe, I discovered a top I’d forgotten I had and through reading others’ blogs, I’ve got more projects than even in my stash. Ciao! For a while now, I’ve wondered how to create one of those pleated necklines so often seen on Ready-To-Wear tops and dresses like this. Were the pleats a part of the pattern? Could I pleat the fabric first and place the basic block on top afterwards (er, no…)? Where would I place the pleats and how wide should they be? My questions were answered by my pattern-cutting tutor who showed me how to adapt my bodice block into a pattern for a wide-necked, pleated top that would need no zips or closures. I sewed the top impatiently one weekend afternoon, desperate to see how it would turn out but not holding out much hope for making a wearable garment. No money was spent: the thread had been a giveaway and the green bias tape was a remnant so old that I couldn’t believe I hadn’t thrown it away! The fabric – a beautifully printed Alexander Henry poplin – was also a freebie. I doubted that I’d ever be able to create a wearable garment out of it, on account of its strange background colour which I can only describe as Nicotine! So, imagine my surprise when this first draft, my glorified calico, turned out to be quite graceful and a real pleasure to wear. My Nicotine Surprise is not without its faults. The poplin is too stiff to show off the design to any advantage. The pleats point downwards towards the bust point whereas ideally they should radiate out like sun rays from a circular neck. Also, the next time I make this top, I’ll place the neckline on the bottoms of the pleat stitching, so that their construction is entirely hidden in the seam allowance. All I need is a trip to Goldhawk Road for the right fabric and lots of tracing papers to show you guys how to do it too! After making the universally popular Polar Bear, I was keen to see how the Burda 9596 Pattern for a girl’s coat would turn out in a different fabric. My brief was to make a fun and smart cover-up for those colder days that await us in the next 6 months of our so-called British Summer Time. I wanted to use corduroy. As a little girl, I loved the corduroy flares that my grandmother had made me, and when I’d grown out of them, she converted one of the bell-bottoms into a pencil case for me! There was something very friendly and tactile about those velvety ridges. It took me a while to find the right fabric. The shops had a limited range of corduroy in colours too dull for childrenswear, though some great needlecord samples came in the post from Brisbane Moss and Myfabrics. But a trip to Goldhawk Road proved decisive. I found a vivid purple at Orya Textiles and though I had some misgivings about the thick ridges (5 wale is the kind of thick corduroy used in upholstery), I spotted some lime-green cotton satin a couple of doors down in Unique Fabrics and, being a big fan of purple and green together, I grew determined to make the two work. The total cost of the fabrics came to £20 with another £4 for the buttons from MacCulloch & Wallis. View A of the coat is quite fancy – with a peplum, topstitching and contrast cuffs. Much as I love it, I realized that the lime and white polka dot fabric that I’d bought for the cuffs would have been too much! So I made a last minute decision to go for the subtler View B with the length of View A (so as to keep the swingy skirt). I used the polka dot fabric for making the bodice lining, i.e. the inside parts that don’t need to be as slippy, whereas the sleeves and the skirt were lined with lime cotton satin. The only other modification to the pattern was the coat hook I added (pretty essential in a coat, I think). It was made from a tube of fabric and inserted between the collar and the back facing (pattern piece 14). I’d say that there a three parts to making the Burda 9596. The first involved cutting out the 15 pattern pieces, marking them and applying the interfacing. This seemed to take ages. It was nerve racking having to stick to the grainlines so carefully: the up and down ridges would have given away the slightest mistake. But the second part – machine stitching – was relatively quick and straightforward. It’s a real moment o f joy when the first sections come together and the coat begins to reveal its character! The last part involved lots of handstitching. After a couple of hours of sewing the lining to the thick coat hem (which I haven’t done entirely evenly), my fingertips were so sore I had to take a day off before being able to face the buttons. My daughter has named her coat Violet and seems pleased with it, though wondered why the lining is in two fabrics (the spots alone would have done!). She also pointed out that the coat is too big. I wish I’d know that a spring coat doesn’t need to accommodate layers of warm clothing underneath, or I might have graded it down. Hopefully, by the time I get to make Burda 9596 again, I’ll be closer to being a pro sewista and will manage to pull off a perfect version! Finally, a couple of literary references that kept popping into my head as I wrote this. For the youngest readers and their mums, my daughter and I recommend “Corduroy” by Don Freeman. This beautifully illustrated story features a teddy bear in corduroy dungaress and a kind girl called Lisa. This all started on a Saturday morning in May, one of those warm spring days that smell like clean linen. Delia had gone to the supermarket to shop for the week’s meals. She was standing in the produce section, languidly choosing a bunch of celery. Grocery stores always made her reflective. Why was it, she was wondering, that celery was not called ‘corduroy plant’? I was wondering what to wear for the OWOP! (One Week, One Pattern) project: this is the initiative organized by Tilly and the Buttons where for a whole week from Saturday 24 March we wear and post pictures of garments made from a single pattern. Now, were it summer, I’d have worn the many dresses I’ve made from either of my two favourites patterns: Burda 7378 or New Look 6459. But the weather at the moment is capricious so I’m going with the various skirts I’ve made from the Basic Skirt Block which I’ve drafted by following the instructions in the Reader’s Digest Complete Guide to Sewing. If you’ve never drafted a pattern and would like to give it a try, this is a simple way to start (don’t let the amount of verbiage below scare you!). You’ll end up with a block (or sloper) suitable for making a knee-length skirt fitted to your shape by means of two front and two back darts. As I only had a remnant of this beautiful, faux leopard fabric from here, the skirt I made turned out a mini, but the process is exactly the same, only the length is shorter. Equipment: a tape measure, a long ruler, a triangle/set square, paper (newspaper or wrapping paper on the plain side), pins and a sharpened pencil. And a long mirror! If you want to add seam allowances (see Step 4) to make a skirt pattern out of the block, I recommend one of these sewing gauges that I can’t live without. Tip: not sure where your waist is? Tie a string firmly around your middle and it’ll settle at the narrowest. If this seems higher than you’d like your skirt to be, don’t worry as we’ll be “dropping the waist” in Step 3. Tip: if you’re unsure of your desired skirt length, stand in front of a mirror whilst holding a towel over your bare or stockinged legs. Raise and lower the towel whilst looking at its edge and your legs in the mirror. When you find the view that’s the most flattering, measure from the waist to the towel edge. Please note that the block includes ‘ease’ but no seam allowances (ease is the extra width given to a garment to ensure that it’s not skin-tight). Seam allowances are added in Step 4 so that the BSB become a pattern. Keep your original block (it’s the “master pattern”) and you can use it for other skirt patterns (I’ll be developing it into A-line and pencil skirts in future blogs) or to check against measurements of any commercial patterns you might use. Mark a new point E on the waistline by measuring 2-3cm from B to A. If your figure is of the “straight up and down” type, go in 2cm, but if your waist is relatively narrow compared to your hip, go for 3cm. I’ll opt for 3cm, so my A-E=21.5cm. Mark a new point F on the side by measuring 15-25cm from B towards D. This marks the widest part of your hip. The widest part of my hip happens to be very low on account of something technically known as ‘saddlebags’ so my point F is 25cm below B. Next, join points E to F with a gentle curve which should mimic the side of your waist going down to the widest part of your hip. Look in the mirror to get an idea of the shape of your curve. If you need a guideline, join E to F with a straight line then draw a curve some 0.5-1cm beyond it. Mark the dart by drawing diagonals from the waistline to the bottom of the foldline. Cut out the Skirt Back, making sure all the letters and labels are on the block. a) Widen the block by 2cm to the left: extend line B-A by 2cm to create point a. Extend line D-C by 2cm to create c. Join a-c. The waistline a-E is now wider than at skirt back and in my example measures 23.5cm. My front dart is 3cm wide. Draw the two diagonals on each side of the foldline, narrowing from the waistline to the bottom of the dart. Cut out and label as in Step 1. Here, the waistline of the two blocks is shaped to the figure. First, drop point A on the Skirt Back by 2cm to a new point WA. Fold the dart and pin it closed. Draw a smooth curve from E to WA. Keeping the dart pinned, cut along the line of the curve. Repeat the process for the Skirt Front. If you like to wear your skirts lower-slung than mine, you could use a sewing gauge to mark a lower waistline and slice into the block again. This means adding seam allowances, cutting instructions and grainlines to a copy of the block. For the Skirt Back, copy the block onto another piece of paper (or trace it: I use the cheapest greaseproof paper) and add seam allowances of 1.5cm for the waist, centre back and the sides and 3-5cm to the hemline. Label with “Cut 2“, mark the zip placement on the centre back if you wish, draw the grainline and cut out along the edges of the seam allowances. To add seam allowances to the Skirt Front, copy or trace to another piece of paper and 1.5cm seam allowances to the waist and the side, and 3-5cm to the hemline. Draw a foldline on the Centre Front side and label with “Cut 1 on Fold“. Cut out. After what might seem a lengthy and labourious process, you might want to rush out and cut your fabric right away. Unless you’re using a dispensable fabric, I’d urge you to test out your pattern on some calico or a dust sheet: yes, it’s time to ‘fess up and admit that the Reader’s Digest formula for the BSB is not foolproof and may need tweaking. My “ghost skirt” demonstrated that I could have done with a more generous hip allowance and a tighter waist. It didn’t take long to adjust my BSB and pattern and the final result fits perfectly. Though it might be a bit short and cougarish. “Do you need help getting into that dress?” was the first comment on my new Simplicity 2305. I was struggling to get my head and arms through at the time. Because it was cold, I’d put the dress on over a long-sleeved base layer in the same colour (black) and the combined effect of the two garments was a certain “Leg of Mutton” appearance in the sleeves. Now, I have nothing against Leg of Mutton sleeves. They can have a wonderful dramatic effect, as in this picture, and if I were very, very evil, I’d have sleeves like this all the time. But they make this dress look like period costume. “It’s a bit…. Henry VIII,” continued the familial commentary. So why do I look happy wearing it? Two reasons. Firsly, the relief at finishing a project that had me making so many mistakes I feared I was going to blunt my entire collection of seam rippers in the process! Sometimes it’s not good to rebel against pattern instructions. For example, there’s a reason why a neck band strip is cut on the bias: so that it lies flat. But no, I thought I’d be cleverer (ha!) and go against the grain, thereby matching the waist band and cuffs. The result was a wrinkled neck band which refused to lie flat and no amount of hot pressing was going to persuade it otherwise. Luckily, the mistake was fixable. Other aspects of the design were new to me and I didn’t find the instructions as plain as I’d have liked them (I wouldn’t recommend this pattern to a beginner). I usually struggle with zip insertion and here for the first time I was in a situation where the top of the zip opening was stitched closed (the sleeve seam). The instructions on attaching the waistbands were clear if you know what you’re doing, but I got mixed up between the symbols for the facing and interfacing so some serious unpicking took place at this stage as well. I’ve been desperate to make this dress since first spotting the pattern in the Stash of the Slapdash Sewist and I was lucky to find for it the finest needlecord (21 wale). It came from the Cloth House, No. 47 and wasn’t cheap. So after stumbling in the making of it and then having to get used to its strange silhouette, I am delighted to find that it’s very flattering. It must be the large sleeves which make the waist appear smaller in contrast. I can tell that I’ll got lots of mileage out of it so whilst it’s not a perfect dress (see below), the Anne Boleyn is a good wardrobe staple. Making the neck wider. Not plunging as in View B, but just so there’s less material and more collar bone on show. It might even work in an off-the shoulder design. I’d extend the sleeves to a 3/4 length, with the cuffs tapering to the shape of the forearm. Although I’ve added lining to the skirt, it stops 1cm above the optional slit on the right hand side. This still leaves rather a lot of material gripping the knees so I think losing the slit and extending the lining would work better on heavier fabrics, especially if you intend to stride about in it. Last but by no means the least: I’d fit a longer zip. Although I’d used a zip longer than the recommended 12″, the dress isn’t easy to get into and the UK size 10 with a size 12 skirt can’t go over the fuller bosom of my dummy (she’s 92cm/36″). But if the headless thing won’t wear it, I certainly will, and lots. This wide belt is a goth remake of the one I wore with my school uniform. It was made up of a “nurse buckle” and a petersham ribbon. The ribbon had a section that was stitched on three sides to make a coin pocket next to the buckle – for the lunch money. This is an easy project so long as you’ve got the necessary bits. The belt can be adjusted to fit over a dress or a coat. I made it to go with the Simplicity 2305 dress. if the grosgrain would benefit from stiffening, back it up with the a length of fabric (see Step 2 below). I used needlecord from which I made the dress and turned it so it was against the grain (so the ribbing goes left to right). My strip was 1m by 8cm: 5cm desired width, plus 2 x 1.5cm seam allowances. 1 Baste velvet ribbon to the centre of the grosgrain. Stitch the long sides of the velvet ribbon onto the grosgrain and remove the basting. 2 If you’re using a backing strip, press under 1.5 cm on both long sides of the fabric. Check that the backing strip is the same width as the ribbon side then pin together. Stitch both long edges, keeping as close to the edges as possible. Press, first testing a small area of belt to check for heat tolerance. 4 Insert the pressed edge back under the slider and towards right side clasp. It’s a tight squeeze but you can stick a pin into the fabric edge and push it under centre bar of the slider till it makes it through the other side, then pull along. 5 Pin the pressed edge onto the backing of the belt and stitch down. If you find this last step as confusing as I did, get a bra (yes, a bra!) with adjustable bra straps and follow the path of the strap in and around the slider. It’s exactly the same.